For the first time today, I decided to take a mini writing retreat in my local public library, and I’m jolly glad I did. 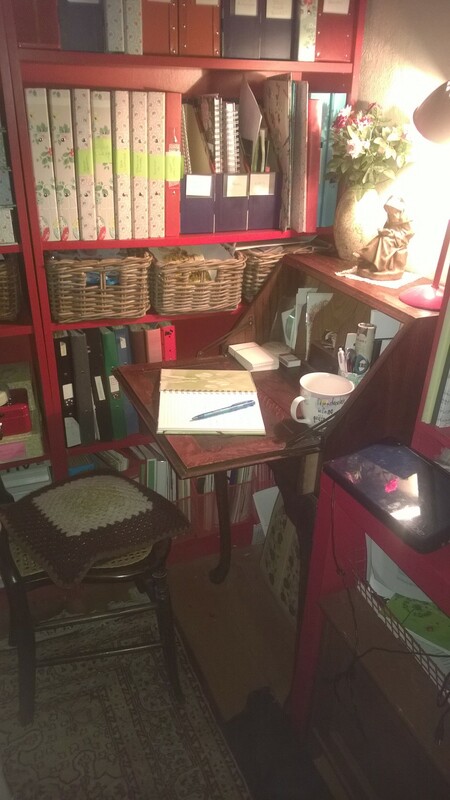 I’m lucky enough to have my own study at home, in which I’ve squeezed both a business desk for my freelance work and, for my fiction writing, a tiny upright bureau that used to be my grandfather’s. 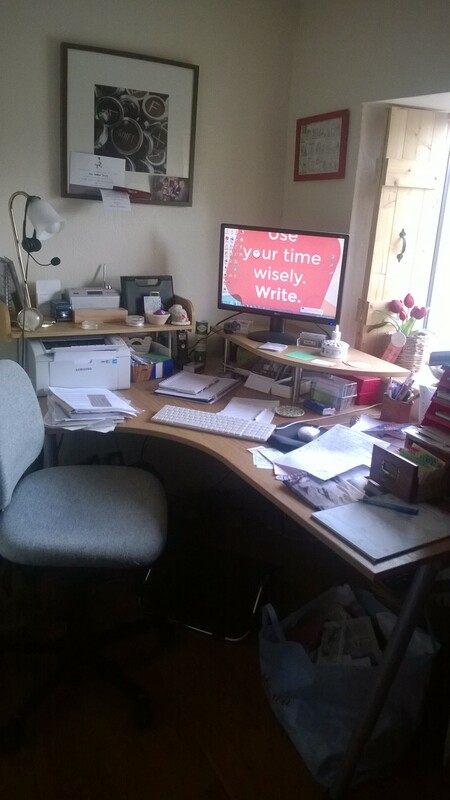 Even though it’s currently in a relatively tidy state, I needed some cooler air in which to write. My study’s upstairs, and all the heat in the house seems to gravitate towards it and stay there. As I had to go into our nearest town anyway to run an errand, I decided to take my notebook with me and sit in the calm, open-plan space of the Yate Public Library, where it might not be much cooler, but at least the air would circulate better. Like a human thermometer, I roved around our large, single-story modern library, trying to decide the best place to settle. It’s a new, light and airy building, thanks to a National Lottery grant a few years ago. Easily the coolest spot was the children’s section. This was also one of the quietest, as I was there during school hours. 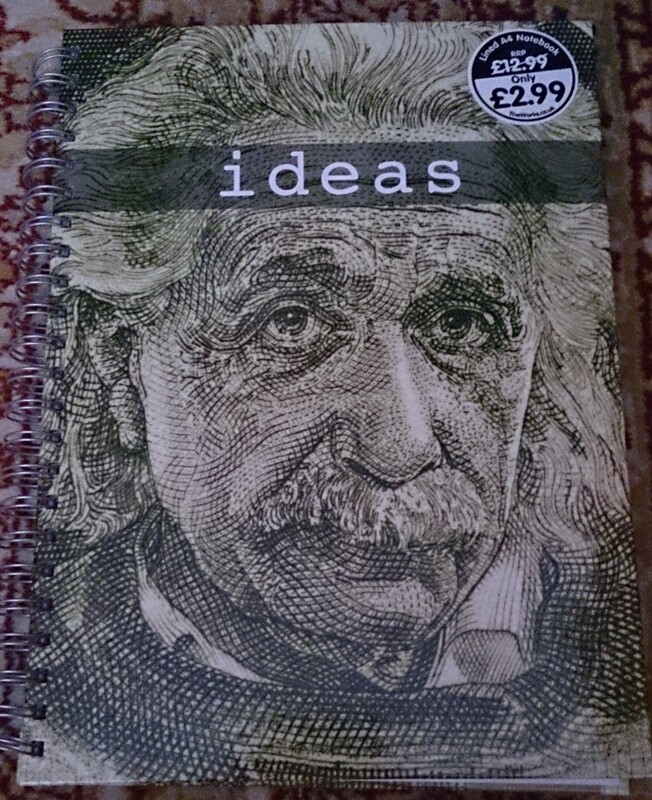 After I’d been scribbling away happily in my new notebook for half an hour, a small girl aged about 3 arrived with her mum. She made a beeline for the open boxes of picture books and quickly made her choice. “But you’ve had that one before!” complained her mum. Undeterred, the little girl curled up in a chair to read it, or at least, to read the pictures – a great way to develop future reading skills, by the way, as is enjoying the same books over and over again. Well, now I know what I’ll be doing for the rest of the day: smiling. With thanks to Yate Library and its wonderful staff for providing such a wonderful resource to our local community. Both of the two short stories in the above posts are also available in the new paperback edition of Quick Change, my flash fiction collection. I don’t know when silence in libraries stopped being compulsory, Judith, but maybe they ought to bring it back! I remember being ‘hushed’ as a child, Debbie – it made me think how special libraries where. Miss that. I haven’t been to the library in quite awhile. Should really try to go more often. Get a lot of writing done at the library. Plus, I get to be surrounded by shelves and shelves of books. Have never written in a (public) library – only in Uni ones – maybe shd try it! Love the story about the small child, how true your comment is!